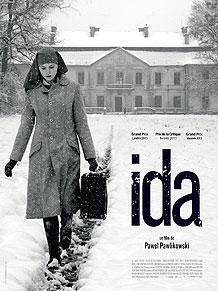 The Hope College Knickerbocker fall film series continues with “Ida” on Monday-Saturday, Sept. 15-20, at 7:30 p.m. at the Knickerbocker Theatre in downtown Holland. “Ida” is a moving and intimate drama about a young novitiate nun in 1960s Poland who, on the verge of taking her vows, makes a shocking discovery about her past. Anna, a sheltered, 18-year-old orphan raised in a convent, is preparing to become a nun when the Mother Superior insists she first visit her sole living relative. Naïve, innocent Anna soon finds herself in the presence of her aunt Wanda, a worldly and cynical Communist Party insider, who shocks her with the declaration that her real name is Ida and her Jewish parents were murdered during the Nazi occupation. The revelation triggers a heart-wrenching journey into the countryside, to the family house and into the secrets of the repressed past, evoking the haunting legacy of the Holocaust and the realities of postwar communism. The film is in Polish with English subtitles. It has a run time of one hour and 20 minutes, and is rated PG-13. Tickets for the film are $7 for regular admission and $6 for senior citizens, Hope College faculty and children. Tickets will be sold at the door but are also available in advance at the Events and Conferences Office located downtown in the Anderson-Werkman Financial Center at 100 E. Eighth St. The office is open weekdays from 10 a.m. to 5 p.m. and can be reached at (616) 395-7890. Hope College has again enrolled a record number of students, topping 3,400 for the first time. The Hope College men’s and women’s soccer teams are teaming up to benefit Purple Community®, Van Andel Institute’s grassroots fundraising program.